That said, I really do feel like I read faster and retain more when I’m reading a physical book than I do when I read on my iPad. I appreciate the convenience of e-books — the instant download, the ease of transport, the ability to avoid deciding just what books to take on vacation — but I don’t think they hold my attention in quite the same way, and I know I end up slowing my reading pace to make sure I absorb the material. Although I’ve never ceased to buy and read paper books, I was a pretty early adopter of e-books. 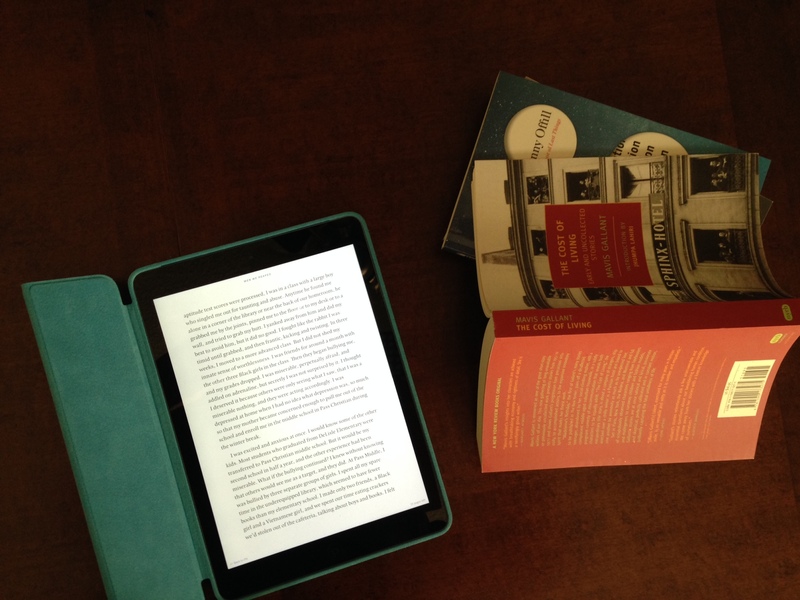 Thanks to my boss, I had a first generation Kindle, and used that for a great deal of work-related reading. Since then I’ve owned a first generation Fire, which I disliked overall, and now I use an iPad, which I find preferable to the Fire, mostly because I use it far more for non-reading tasks than actual reading, but over and over I’ve found myself defaulting to paper books. Not out of habit, not because I wanted to read a title I already owned, but because the experience feels more rewarding somehow. I’ve always been a book buyer. My mother tried to train me early on to use the library, and I did and still do, but owning a book always gives me an added thrill. I love having an assortment of unread material on hand, and I particularly appreciate being able to glance at my shelves and see right away what I have. E-readers require me to scroll through a list, or pages of thumb-nail-sized covers, and I often find myself forgetting I own something and buying it again when I can’t visualize it sitting in my bookcase. I’m also a fan of the look of books. Cover art, typesetting, tone of the paper. I like the feel of a book in my hands, the visceral pleasure of turning the pages and seeing them gradually shift from right hand to left as I progress through the story. I enjoy pretty books, collect hardcover copies of my favorites, and have been known on occasion to repurchase something I own because a new edition has a gorgeous cover I can’t resist. Reading for me is an aesthetic experience in addition to a mental process. There’s also a certain convenience to paper books that I don’t feel e-books can match for all their other handy features. When I want to flip back and reexamine something in a paper book, it’s a simple matter of turning back until I spot what I’m looking for, be it text or a chart or a map or whatever. I keep a finger tucked into the page I’m currently reading to hold my spot and can move easily back and forth as many times as I wish. E-books make this sort of reflection a little more difficult. It’s one of the reasons why I prefer reading nonfiction in particular in a paper format. Does that mean I plan to stop reading e-books? Of course not. I own a number of e-books I’ve still not read, and in keeping with my effort to stop buying books for a while, I have an Oyster subscription and a library app to give me access to newer titles without braving the temptation of the bookstore. But paper books remain my preferred reading format, and I’m willing to bet my favorite e-reads of 2015 will get added to my wish list of titles to add to my bookshelves. Because while I might be willing to read a book electronically, that’s not how I plan to reread it. Nephele has read 0 books toward her goal of 52 books. By Alexandre Duret-Lutz, used under a Creative Commons Attribution-ShareAlike 2.0 Generic license.